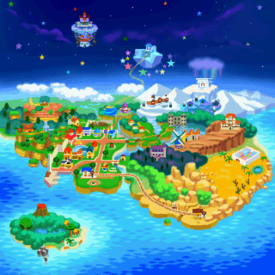 The Crystal Palace is a location where the final Star Spirit is being held during the events of Paper Mario. This palace is a 'mirror' filled castle with puzzles in every which way. Mario and his teammates must solve the puzzles and fight off many Duplighosts and White Clubbas to get to the boss. After solving the puzzles, they manage to reach the Crystal King. After they defeat him, they free the last Star Spirit, Kalmar. Comically, at one point in the palace, four Duplighosts pretend to be Kooper and say they are him, when in actuality they turned into Goompa, Kolorado, Koopa Koot, and Luigi, and act like them (with the Luigi one even calling Mario "Brother"). Many of the walls look like mirrors, but they're actually just glass, because the reflections are always Duplighosts in disguise. The palace has two areas, the front (main) area and the rooms behind the glass walls. Each will need to be inspected carefully, because going back and forth between them can be confusing, since they're almost exactly the same. The Crystal Palace was once a shrine to the Star Spirits, but its location and how to get there became lost over time. The only way to reach it is a secret passage in Shiver Snowfield to Shiver Mountain, where at the top is the palace. For enemy formations in the Crystal Palace, see here. Star Piece In a cave at the very west of the area behind the outside mirror. Under a hidden panel below the question block in the big Albino Dino room. Under a hidden panel at the symmetrical position in the small Albino Dino room. Super Shroom In a question block near the door in the room to the north of the first room. Shooting Star At the very east of the area to the north of the first room. Maple Syrup In the question block near the door in the big Albino Dino statue room. Jammin' Jelly In a hidden block at the symmetrical position in the small Albino Dino statue room. P-Down, D-Up At the very east of the area below the room to the north of the first room. P-Up, D-Down In a treasure chest at the very east of the area below the small Albino Dino statue room. 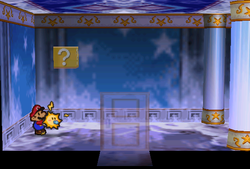 Triple Dip In a treasure box in the fourth room after the red key (requires using Bombette on the wall behind the mirror one scene earlier). Blue Key In a treasure chest at the very east of the area to the south of the first room. Red Key In a treasure chest at the very east of the area below the room to the south of the first room (requires Spin Jump breaking the north room first). Palace Key In a treasure chest at the very east of the area below the big Albino Dino room. Jammin' Jelly On the mirror side, in the western area with the small Albino Dino statue, Mario should Tornado Jump northwest from the door, above the Spin Panel, to reveal the hidden ? Block. So spacious! You gotta love the high ceilings, huh, Mario? You could set up a basketball court in here! The rich really know how to live! This room is pretty cramped. I wonder what it was used for. Servants quarters, maybe? I never trust polished floors because they're often slippery. I really don't want to fall and bump my head. Even though we're indoors, it's still freezing in here! I mean, seriously, the floor's frozen... I hate it. It looks like your basic passage. Since we're in a palace, I'll call it a palatial passage. Ah-ha! It's a cave, isn't it? It's nice to get a breath of fresh air, but I must say that it's even colder out here than in there. Unbelievable! Is this like a waiting room? I don't know how people could deal with so many rooms. It's totally confusing. My reflection is weird. Seeing myself in the floor is starting to freak me out. Boy, these rooms all seem to look alike, huh? It seems symmetrical. You know, the left side is a mirror image of the right side. It'll be really easy to get lost in here. Continue with care. OK, Mario? This is a long corridor, huh? Hey! That's our reflection in the floor! It's like a mirror! This place almost makes me miss the desert. I'm freezing! How can you stand it? This is a long corridor, huh? Even the wallpaper around here looks frozen. Although I do very much like the star pattern. Mario, have you noticed our reflection on the floor? I don't trust a floor this shiny. I bet it's slippery. The architecture of this place is really bizarre. We pass back and forth through these glass walls. Not knowing what's a mirror and what's not really bugs me. An indoor bridge? Now I've seen everything! I thought you already knew that you could activate switches by giving them some sort of shock. You can use Kooper or Bombette to do it, you know. Don't forget! All the rooms look alike around here. Did they design this area to intentionally confuse us? The official line on this palace is that it's temporarily closed because of the snow and ice. Do you think Kolorado would research this place? I wonder if he's already planning a trip here... Maybe he's never heard of the palace at all. Or maybe he just has no clue how to get up here. It's easy to believe that this place was originally built as palace to honor the Stars of the sky. Merle said that, didn't he? It's terrible that people have forgotten it and don't come here anymore. What a waste. Maybe after we clear it, the tourist trade will start anew. That's one big stone statue. Even you couldn't budge a statue that massive, Mario. If it were just a bit smaller, we could probably push it. Hey, Mario! You can reach far-off objects by jumping and kicking Kooper's shell, isn't that right? So he can activate switches that are across wide gaps or even in reflections, right? I wish I could do that, too. Well, I've determined that there's nothing here but cold, and I don't like it at all!!! I think my body temperature has dropped about ten degrees since we've been here. I should've kept that scarf we gave to the snowman. Mario, you don't look cold. Is it just because I'm a Goomba or because you're a fine-tuned adventuring machine? I wonder how far we've gone. I really can't say enough good things about the star decorations here. I mean it. It's such a pity that people don't visit here. Those Albino Dinos... They seem to turn and face us when we talk to 'em. It looks like we can take a break here, doesn't it? If only we had some hot cocoa, we could take a real rest. Hmm...a back door. You think it's going to be a dead end up ahead? Hey, by the way... What do you think the Star Spirits are up to right now? I was just thinking of 'em. Once a special place to wish on stars, it's now deserted. This deserted palace was first built for wishing on stars. A Star Spirit was once held here by the Crystal King. The Star Piece in the cave outside Crystal Palace. The Star Piece in the big Albino Dino statue room. The Star Piece in the small Albino Dino statue room. This page was last edited on July 23, 2018, at 18:21.